Out of curiosity, I recently spent some time (maybe too much time) taking measurements of my software renderer, DIWide. 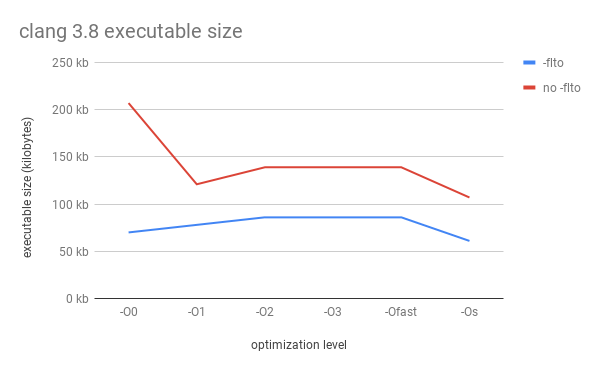 I compiled it with different compilers, at different optimization levels, running different code paths, and measured the speed of the generated code, as well as the size of the resulting executable and the time it took to compile. The program in question has a complex inner loop with many small functions to inline, a wealth of common subexpressions and loop-invariant calculations to hoist out, a healthy mix of integer and floating point calculations, and a variety of memory access patterns and different kinds of instructions to schedule. 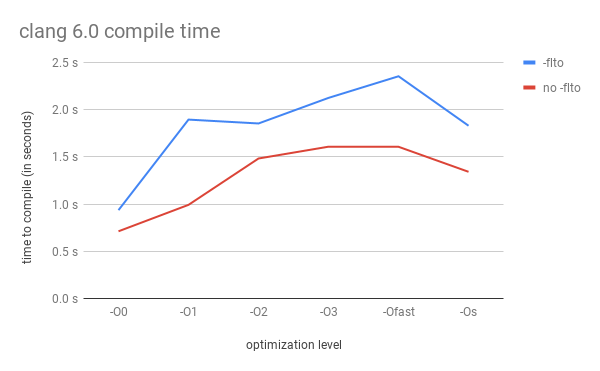 For this reason, I consider it a good code sample for testing the compiler's overall capabilities, or at least better than a series of microbenchmarks. 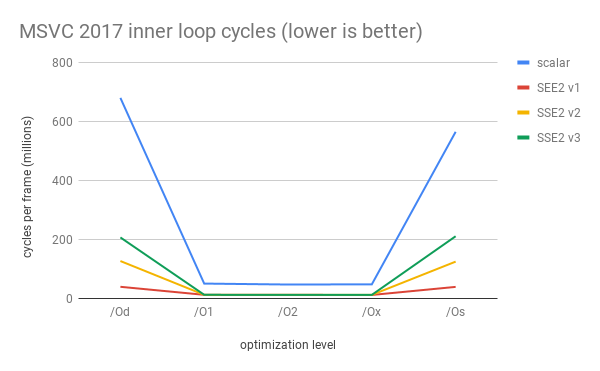 Execution times represent time spent inside the inner rasterization loop each frame, measured in CPU cycles as reported by the __rdtscp() intrinsic. Only 3 significant figures are given, because anything beyond that would just be extra noise in the data, and frankly I suggest taking the third digit with a grain of salt. Compile times represent the wall-clock time taken to compile all code in the project (see code linked above). 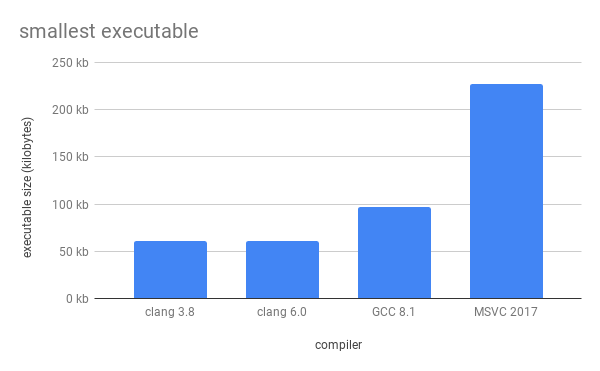 Compilation was multithreaded using ninja for clang and GCC, and using the /MP flag for MSVC. Linking was single-threaded. Executable size measures the file size of the generated executable only, not including any assets or packaging. All timings are minimum values taken from several back-to-back runs. One of the main things I wanted to test was the impact of different abstractions on code generation with SIMD intrinsics. Using SIMD intrinsics directly in code is verbose, and is not easy to map back onto its scalar equivalent, which makes it comparatively difficult to read and write. This isn't a big deal for small and simple functions, but becomes a hassle with long, complex passages of SIMD code. One way to improve readability is to wrap intrinsics in convenience functions with shorter names. This cuts down on line noise somewhat, but it's still difficult to map back to scalar code. 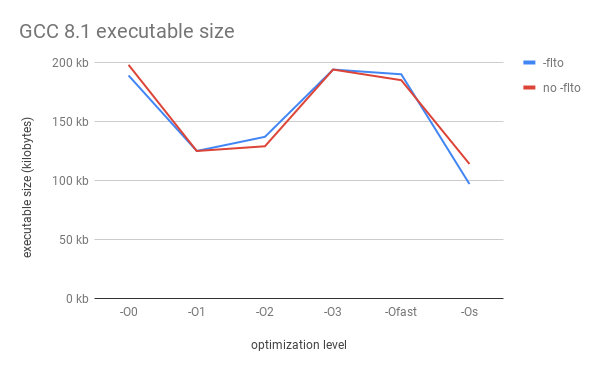 Wrapping SIMD primitives in structs and writing operator overloads solves this problem, making most of the code look almost identical to its scalar equivalent. 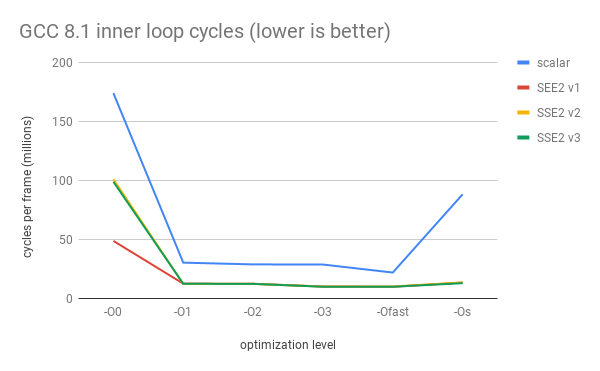 However, I wasn't sure exactly what performance impact it would have, so I wrote three different versions of the rasterization loop to compare. 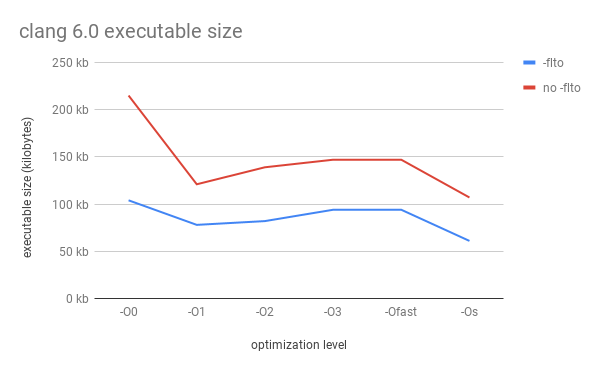 Next, we can compare code size at various optimization levels, with link-time optimization (-flto) on and off. I couldn't get MSVC link-time optimization to work, so it's not included in the data for now. I may try again at some point, and will update the data if I can get it working. I won't waste any space commenting on anything that's already super obvious from the graphs above, but I do want to make note of a few things I observed while collecting the data. 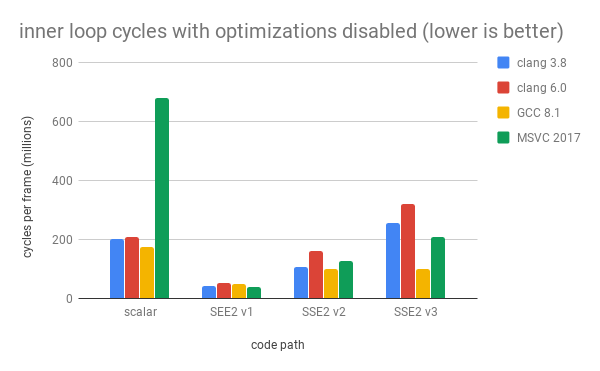 -Os (optimizing for size) differs drastically between compilers. Clang's -Os optimizes very aggressively. 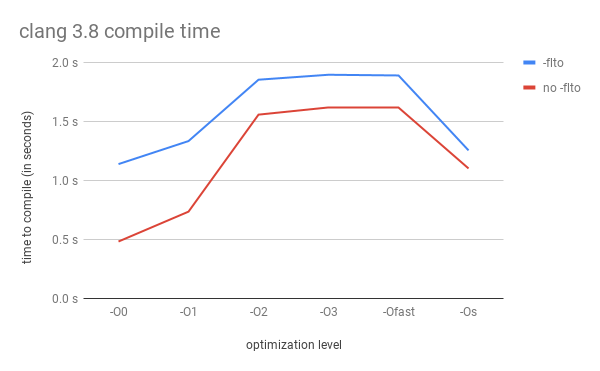 Compilation speed is between -O1 and -O2, but generates code that is just as fast as -O2 and above and smaller than what the other two compilers produce, especially when link time optimization is enabled. It's astonishingly good, and one of the best features of clang in my opinion. 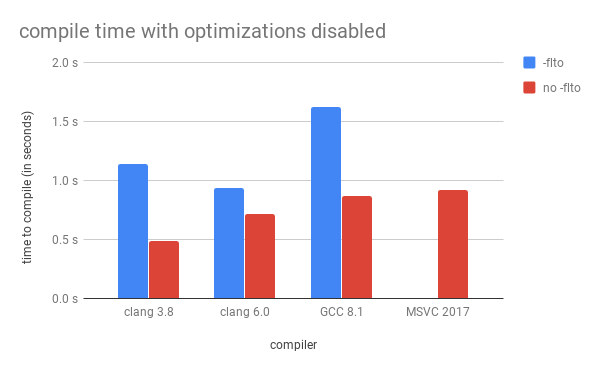 If you use clang, I strongly recommend trying -Os for release builds. And likewise, if you want to ship a small binary, I strongly recommend trying clang as a compiler. 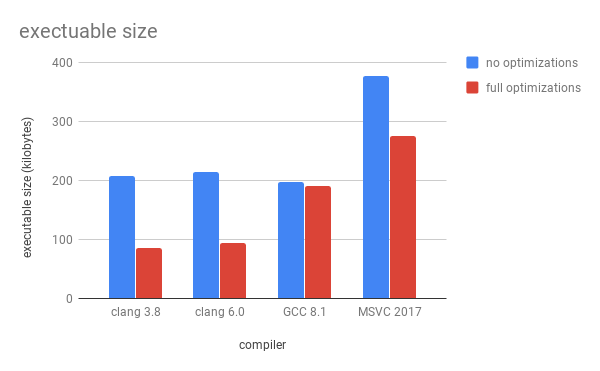 GCC's -Os is not as small or as fast as clang's, and takes an especially large performance hit on the scalar code. It's decent, but not amazing. MSVC's /Os is just abysmal. 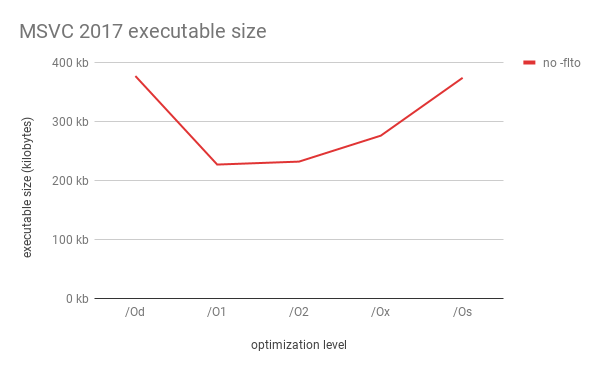 It's larger and slower than every other optimization level besides /Od. The only think it has going for it is that it's slightly faster to compile than /Od, but only slightly. I don't recommend using it for any reason. If you want small code with MSVC, use /O1 or /O2 instead. In clang, __m128, __m128i, and __m128d are treated in some contexts like aliases for the same type, so you can use them all interchangeably without calling cast functions like _mm_castsi128_ps() and friends. In GCC and MSVC, that's a type error. However, in other contexts - like when resolving function overloads by argument type - they are still treated as separate types. In clang and GCC, vector types are treated as primitive types, so you can't provide operator overloads for them directly - you have to wrap them in a struct first. In fact, clang and GCC actually provide some built-in operators on vector types already. GCC seems to provide every operator that would be valid for the underlying type (clang and GCC both treat __m128i as a vector of 2 int64_ts), and clang provides most of the same, except for a few missing unary operators. They are both missing bitwise operations on floating point types, which, while not valid in scalar C++ code, are very valuable in SIMD code, which hampers the usefulness of these overloads in my opinion. They also both overload operator for accessing individual elements. In MSVC, no operators are given by default, but you can provide your own because the vector types are treated like user-defined types. I collected this data out of curiosity, rather than to prove any particular point, so I don't have much in the way of closing remarks. But I hope that this is interesting, and if I'm lucky, maybe even informative. I'm not sure it is useful to graph O0/1/2/3/s levels as line-chart. It should be bar chart, because values next to each other are not connected in meaningful way. Try putting "static inline" next to all the add/sum/mul & operators - + * / for SSE types you wrote. 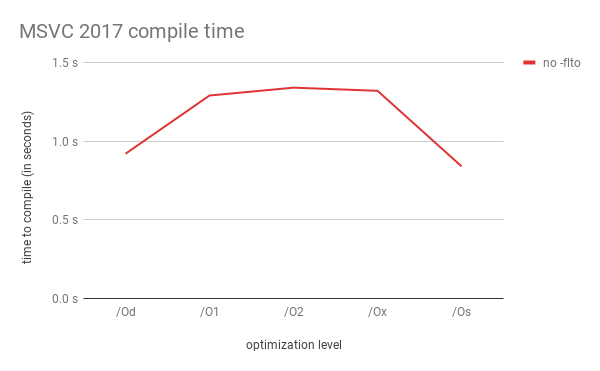 Usually "static" impacts compile time a lot. 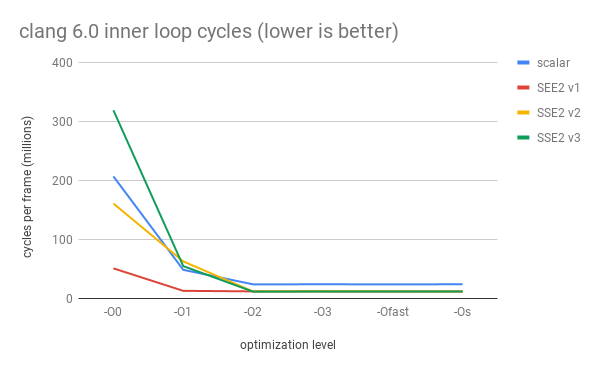 And sometimes it helps optimizer to do better decisions. 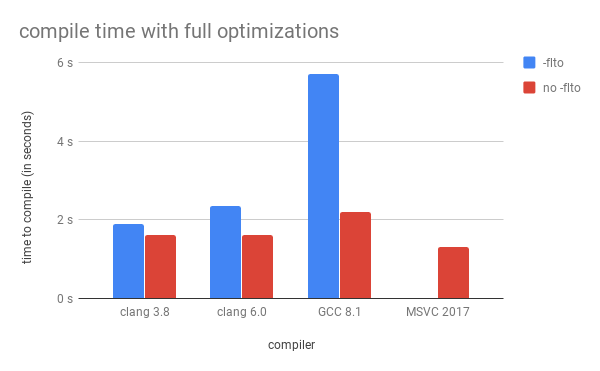 Btw clang has one more optimization level: -Oz, it is based on -Os, but it excludes tree-vectorizer. What about performance for lto vs non-lto builds? I feel like that is more important than executable size. LTO with MSVC is super simple - just add "/GL" to compiler. That's it. You can add "/LTCG" for linker to avoid extra warning. At least in principle, -O0 through -O3 should provide a continuum of optimization (with -Os admittedly being an outlier), but the main reason I went with line graphs is that I found them easier to read, even if they're the "wrong" type of graph for the data, and arguably a crime against statistics. 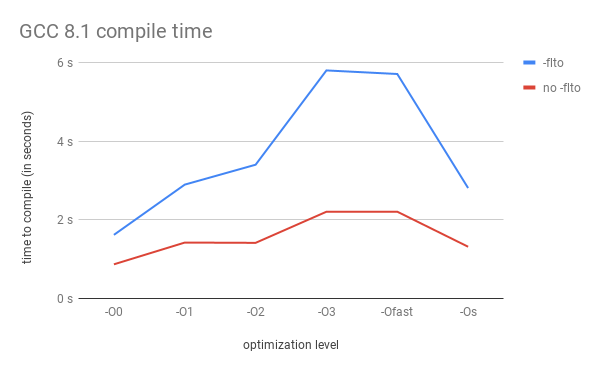 Marking functions "static" for compilation speed is a good idea. It's probably worth revisiting compile times for this project in a lot more depth. I did mark the convenience functions "inline", but not the operator overloads. For functions that small, it turned out not to make a difference on any of the compilers. I'm not sure how clang's -Oz slipped by me. I'll see about updating the post to include it. 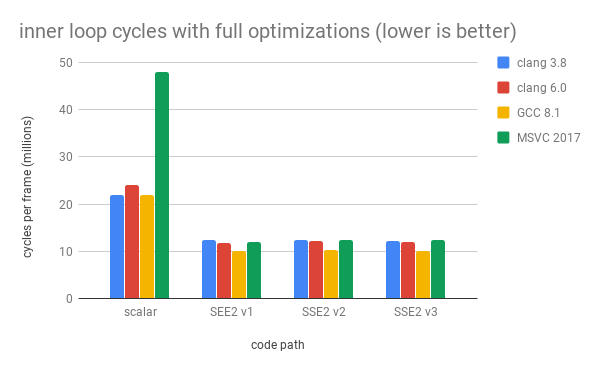 The reason I didn't compare performance with/without link time optimization is because, the way the program is written, there are only a few large function calls across translation unit boundaries, and the inner loop in particular (which is what's being measured) is all within the same translation unit. So it doesn't make a difference in this case. For functions that small, it turned out not to make a difference on any of the compilers. Yeah, this my point - "inline" and "static" is not really about performance of generated code, but more about what compiler needs to do - maintain symbol table, export symbols for linker, etc.. 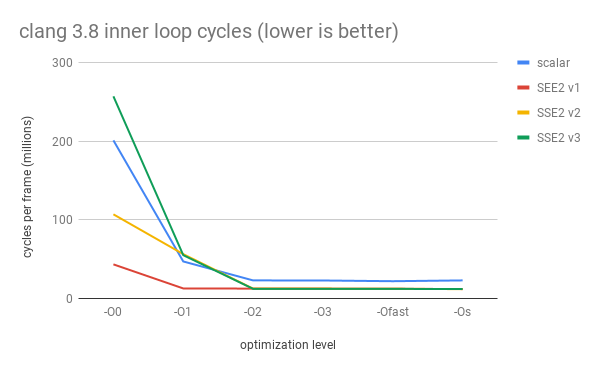 When you said "sometimes it helps optimizer to do better decisions", I assumed you meant with respect to the quality of generated code. So that's why I also mentioned that aspect of it.